ABU DHABI — The Louvre Abu Dhabi, the first museum to bear the Louvre name outside France, presents around 600 pieces in a modern, light-filled structure in harmony with its desert-island setting. Flagged as "the first universal museum in the Arab world", it sits on the low-lying Saadiyat Island, a developing tourism and culture hub 500 metres (1,600 feet) off the coast of the United Arab Emirates’ capital. It is the first museum to open on the island, also the site of the Guggenheim Abu Dhabi, which is still under construction. 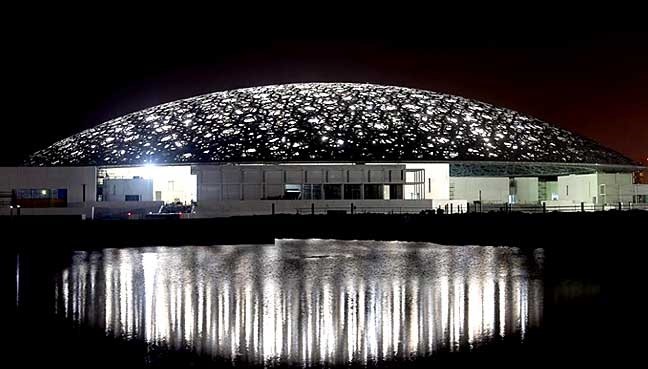 French architect Jean Nouvel was inspired by the island’s position "between sand and sea, shade and light", the Louvre website says. "I also wanted to play on this idea of openness, that of a desert open to the sea," the winner of the prestigious Pritzker Architecture Prize said in September. The site comprises 55 white buildings reminiscent of traditional Arab medinas. Two-thirds of the museum is covered by a dome, 180 metres in diameter, which provides welcome shade from the scorching Gulf sun. Pierced with 7,850 star-like openings formed by the layering of the building’s structure, like interwoven palm leaves, the dome is intended to resemble silver lace. "For me, great Arab architecture (is) geometry with lights," Nouvel said. As the museum put it, "sun filters through the dome like a delicate, protective rain of light... reflecting the constant interplay of light and shadow in the country." The vast project claims to be "the first museum of its kind in the Arab world: a universal museum that focuses on shared human stories across civilisations and cultures". The museum’s price tag was initially estimated at $654 million, to be put up by Abu Dhabi under a deal signed with France in 2007. But costs have risen due to funding and construction delays. Under the 30-year agreement, France provides expertise, loans works of art and organises temporary exhibitions — in return for one billion euros (US$1.16 billion). The Louvre in France takes a 400-million-euro share of that sum for the use of its name up to 2037. For the next 10 years, the Paris museum will lend works to its Abu Dhabi partner on a voluntary basis, for a maximum of two years. For its permanent collection, the museum has acquired hundreds of pieces, dating from the earliest Mesopotamian civilisations to the present day. Thirteen top French museums, including the Musee d’Orsay and the Palace of Versailles, will also loan the Louvre Abu Dhabi 300 works of art over the first year.